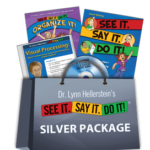 This high-value collection includes two copies of Dr. Hellerstein’s seminar – one on CD and one on DVD; her two pioneering books on using the SEE IT. SAY IT. DO IT!® process at school and home; and a bonus certificate for a free consultation. SEE IT. SAY IT. DO IT!® Organize It! – The companion workbook for teaching kids to visualize goals and create action plans. By Occupational Therapist Beth I. Fishman-McCaffrey, COVT, OTR; Early Childhood Educator Patricia Dunnigan; and Developmental Optometrist Dr. Lynn Hellerstein. 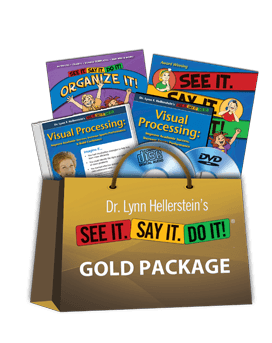 Visual Processing & Academics: New Strategies for Improving Reading, Spelling & Creative Writing Skills – one copy on CD and one copy on DVD. Enjoy learning while saving money on the entire package! Be the first to review “SEE IT. SAY IT. DO IT!® Gold Package” Click here to cancel reply.